Welcome to a brand new year of Reader Appreciation Giveaways, my friends! 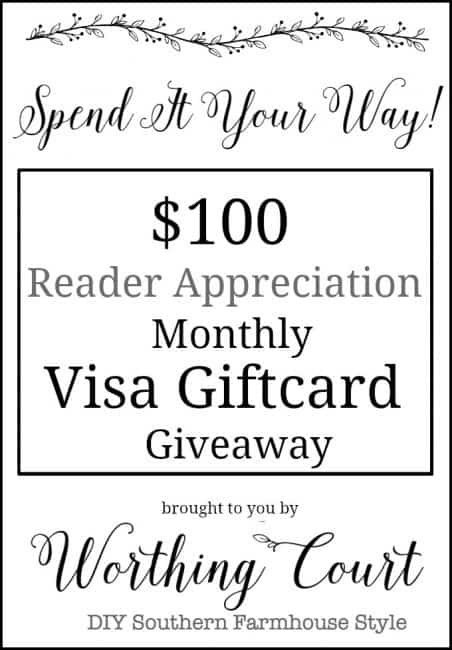 These monthly giveaways are just one small way that I try to thank all of you for being such awesome members of the Worthing Court community. As always, to automatically be entered to win the giveaway, all you need to do it to leave a comment on any blog post during this month. BUT – I’ve added a new feature to the giveaways, which will give you even more chances to win! Scroll down to the bottom to read more. We could all use a little more cash-ola after the holidays, so this month I’m giving away a $100 Visa gift card! SCROLL TO THE BOTTOM FOR AN EASY NEW WAY TO GET EVEN MORE ENTIRES AND TO READ THE GIVEAWAY RULES. THE GIVEAWAY ENDS JANUARY 31, 2018 AT 11:59PM EST. Last month was crazy busy and a lot of my posts centered around Christmas. Even though Christmas is past, maybe you’d like to pin some of these ideas for next year! Or maybe you missed some of makeovers and diy projects from last year that you’d like to take a look at too. To automatically be entered to win the giveaway, leave a comment on any blog post during the month of January 2018. To get up to 5 extra entries, subscribe to my newsletter, then click on “Subscribe To My Newsletter” in the Rafflecopter image. To get 5 more entries, follow Worthing Court on Instagram, then click on “Follow On Instagram” in the Rafflecopter image. 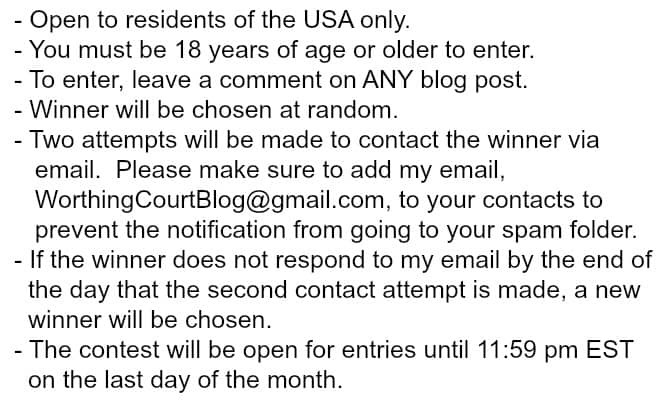 PLEASE READ THE RULES BEFORE ENTERING THE GIVEAWAY. NO PURCHASE IS NECESSARY AND WE NEVER SHARE YOUR EMAIL. Can wait to see your decorating ideas for 2018. Looking forward to your decorating ideas in 2018 to use in my home. So glad I found your blog, looking forward to following you! Love your blog! So many beautiful photos and inspiration!!! Thanks for sharing your creativity! Thanks for the chance to win a gift! Enjoy your blogs.. Looking forward to your 2018 decorating ideas. God bless you & your family! Happy New Year! I look forward to reading your blog each day. I always come away with a new idea! I recently started an online store and your website site gives me great ideas for items to sell on my own site. Loved that you used traditional Christmas colors – frankly tired of seeing so many “neutral” color schemes. Looking forward to another year of beautiful spaces and DIY projects!! Looking forward to many more wonderful ideas in the coming year. I’m new to your blog and love all of your great decorating ideas! Happy decorating to All in 2018! Go and make life beautiful! I’m building a new home and it should be ready by this spring. I’m excited to see your decorating ideas for 2018. I need inspiration! Looking forward to all of your 2018 ideas. I love your style! Your hone is lovely. Love your blog, anxious to see what’s in store for 2018! Love your ideas! Thank you for helping us put the “cozy, homey, welcoming” feeling back into our homes. And please tell your family we gratefully appreciate them ‘sharing you’ with all of us! Love reading all your blogs! I get so much inspiration from each and every one. Thanks for sharing your ideas with all of us! Suzy, I am so happy to have found your blog through a Christmas blog hop! I cannot wait to have time to read your past posts and I have subscribed to your future posts and am anxiously awaiting those too! Hope you have a blessed New Year! Happy New Year! Have enjoyed reading your blog. Happy New Year and here’s to another successful year! Thanks for all the giveaways. It’s great fun and I do very much enjoy your blog. New year, new slate, new ideas!!! I just bought my own home! I’m looking forward to your 2018 decorating ideas. I love the way you decorate with simple items and my love for wreaths have grown since I was introduced to your website!!! Love your blog, I’m always looking for inspiration! Love your blog and all the wonderful ideas. Thanks! Looking forward to more inspiration this year. Excited about the future…wishing you and yours a happy, healthy and prosperous 2018! I love your blog! I can’t wait to see what you share in 2018!!! Excited to see what 2018 brings to the blog world. Looking forward to exciting things you will have for us this year. I have re-recreated so many of your decorating ideas. Keep them coming in 2018! 2018 is going to be a fabulous year. Can not wait!!! Thank you for sharing all your creative IDEAS!!!! I really enjoy seeing your beautiful home. Suzy, I loved the traditional red and green you used for your Christmas decorations! Though many utilize different color schemes that are lovely, I am just so partial to old fashioned red and green. And yet, they way you used them felt to updated and trendy! Have always enjoyed your blog, since way back even before you re-did your first beach house!! I love our style! I would love to have your desk! I keep thinking about painting my desk. I bought it at an estate sale and I suspect it’s from the 60’s. It’s a very traditional “leg” style made by Sligh in Holland Michigan. I prefer the cabriole legs on your desk but I only paid $75 for mine so I decided I could live with the banded style leg. Still LOVE the board and batten. I am doing it this year! On my list of things to do. Thank you again for the wonderful idea. Take care. love everything about your blog! what caught my attention the first time I found your blog was your 2016 Christmas decorations, which I love. And now, with every post you add, I like it even more. Love your blog. In fact I sorta copined your lanterns in your dining room. I made them all by myself. I’m 73 yrs old and did a fairly good job. Would love to send you a picture. That’s awesome, Martha! I would love to see a picture of what you did. You can email it to me at worthingcourtblog@gmail.com. 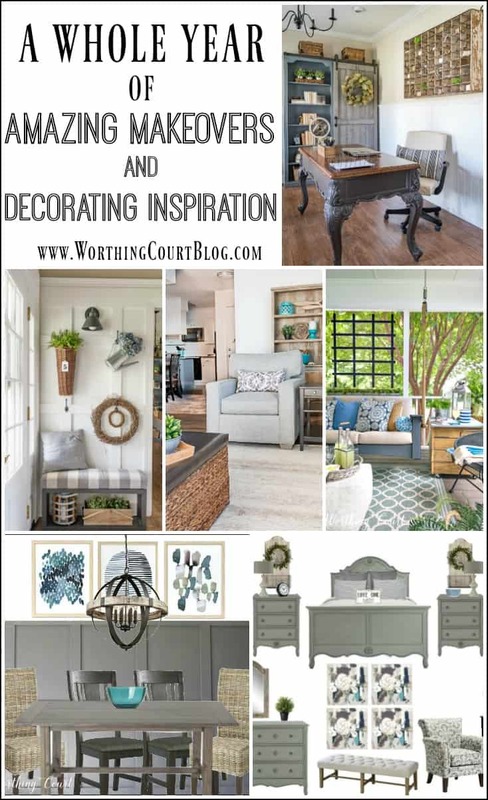 I just love your blog, all your decorating ideas and your instagram! I get so many wonderful ideas and so much inspiration from reading your blog and looking at your instagram account! Thanks for all the your inspiring ideas! I enjoy your blog. Your ideas seem current but not faddish which I appreciate! I love your blog. Your pictures of all your festive holiday decor is so cute! Magazine worthy! Love your blog and look forward to each and every one. Keep up the great work. Nappy New Year to you and your family. Thanks for your generous giveaway and for sharing your beautiful home with us! I always look forward to seeing what you have to show us! It’s like stopping by a friend’s house for coffee or tea! What an awesome blog! I love all the great ideas! I love your blog! Looking forward to seeing all your ideas in2018. Especially love your family/living room with that gorgeous tree, and your kitchen! So cozy! Thx for the giveaways! Love your STYLE ! 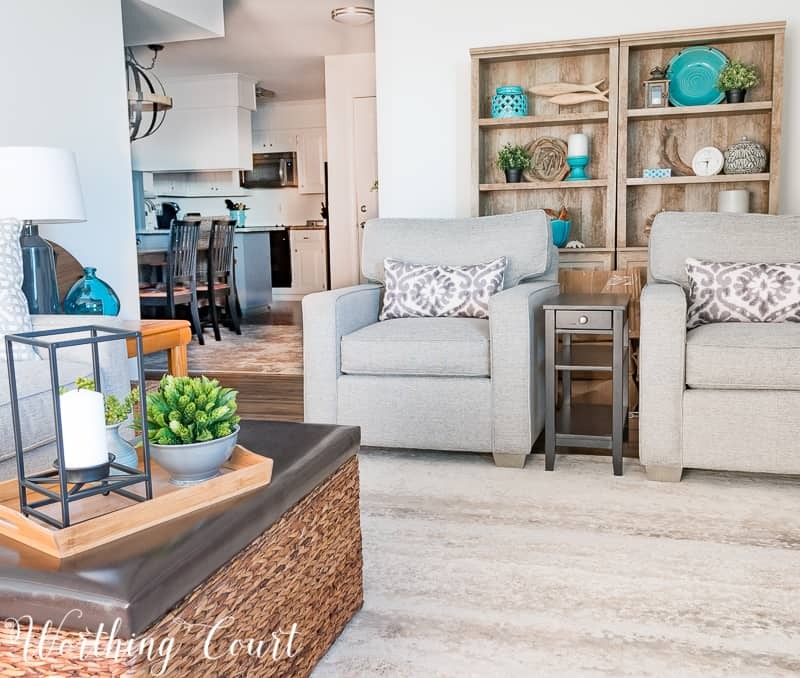 Your tray and family room and entry are adorable ! Your home is lovely! Thanks for inspiring me. Can’t wait to see what you’ve got in store for us in 2018! I am new to your blog and I really love your ideas! Happy New Year! I enjoyed the look back at 2017 and look forward to 2018!! Your blog looks great! thanks for the chance! That kitchen was just GORGEOUS!! Thank you for the opportunity to win a Visa gift card.. A little “cash o la” would be really nice right about now. Happy New Year Suzy. Looking forward to what you have in store this coming year. Thanks so much for all your inspiration! I am reimagining our furnishings into a new (to us) house in a different town. Very helpful to see your ideas. I’m a new reader..have enjoyed all your Christmas decorations. Just beautiful! Thanks again for an opportunity to win!!! I look forward to following all of your adventures in 2018! Love the things you have done and can’t wait to see what you do in 2018. I’m getting ready to redo a bedroom and need lots of inspiration. So bring it on! The Visa card would help tremendously too! I enjoy your blog. Have a safe and blessed 2018! Your house is absolutely beautiful! And ur Christmas decorations are amazing! Looking forward to all your creative ideas in 2018. Oh my still packing up my Christmas decorations! I would like the $100 gift card, might need new stuff to decorate, the house seems empty now. I’m so glad to have found your blog! So many cute ideas! Thank you! new to your blog …love your style… will sign up for emails! 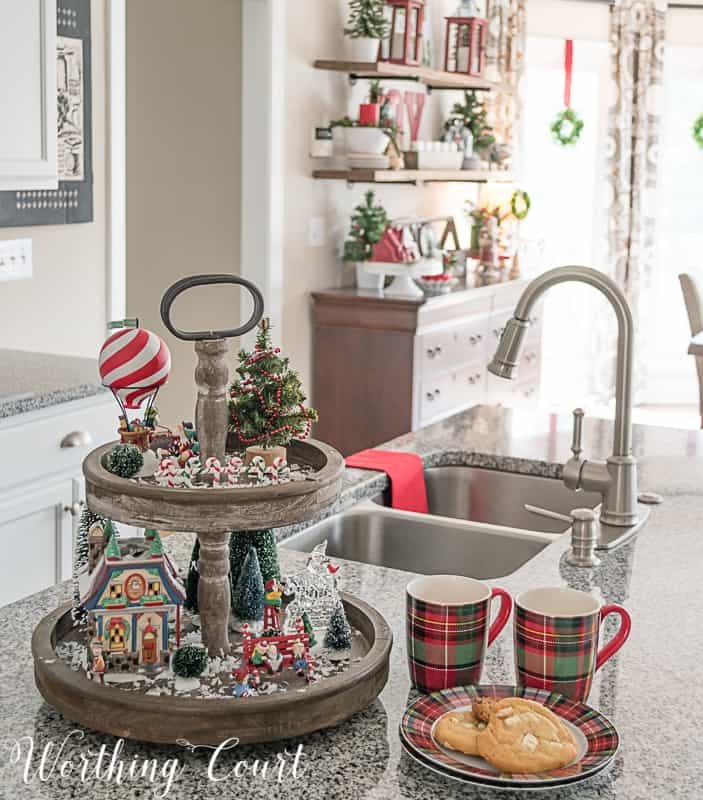 Excited about the new year and all the possibilities in redecorating my home for the different seasons and holidays. I have enjoyed your blog for a long time! Always, always leave with new ideas! You always amaze me with what you come up and all your creations. I’m so excited to see what you give us in 2018!!! Love your blog can’t wait to see what’s in store for the new year. looking forward to more decorating suggestions/ideas! Your decorating ideas are great! In 2018 I hope to slowly make over my tiny house to incorporate that farmhouse look. 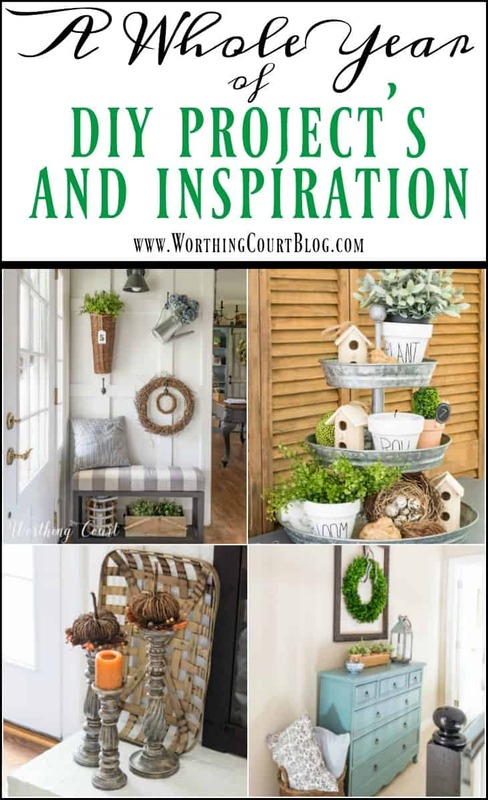 Thank you Suzy for sharing your inspiring ideas and DIY’s love your blog!! Your decorating ideas and photos are amazing! I try to redecorate all the time. I love your two-tiered Christmas Village display! That’s a great idea! I just discovered your blog – what a surprise it was to find a chance to win a prize! I love seeing your DIY projects. So many great ideas! Love your decorating ideas. More my style than many others. Thanks for the giveaway. What a grand way to begin 2018. 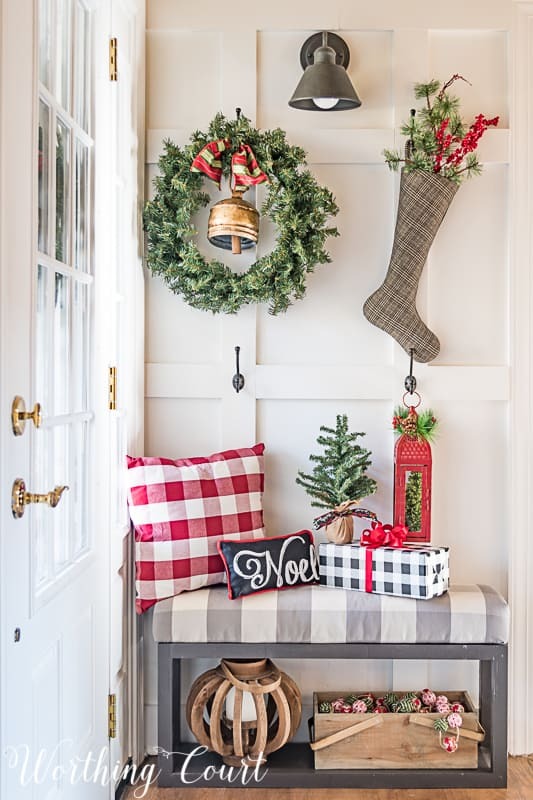 I love your Christmas decor – especially the foyer. So cheery and welcoming. I love your blog! You have such wonderful decorating ideas!!! I’ve been following you on IG and FB for a year or so and really enjoy your blog posts! Thank you for the great giveaway too! Lots of great inspirational ideas found on your site. Can’t wait to incorporate some into my home. ALL the Christmas decorations are packed away and now its just a sweet memory. I have redecorated for Valentine’s Day and loving all the red and hearts. I’m a romantic at heart! Please enter me into the drawing. I am a new reader and enjoy your blog very much. i get to decorate this year! can’t wait to see what i can learn here!! I can’t seem to find a working link to subscribe to your newsletter. What should I do? Glad to have found your blog and looking forward to following. Thank you for the giveaway. Have a great year. Have been down and out for the past few days. Hopefully am on the road to recovery I’m sure a 100 dollar gift card can do that! Please enter me into the drawing. Just discovered your blog. How beautiful and inspirational. I’m excited to see what lies ahead. So looking forward to your 2018 blogs! Thanks for the inspiration!!! So glad I found your blog, I look forward to getting such great ideas each time I read. Thank you for your generous give-aways! Love the chance to win a Visa gift card to get some things for Spring for my home. I love your decorating style. We have a LARGE all white fireplace in our living room and the way you decorated yours has given me ideas for next year. I can’t wait to see what you do during this year, this is the first time I have come across your site so I’m off to catch on past posts. Suzy, you have a great eye for combining colors and for style. I love the look of all your rooms. Thanks for all the ideas! Everything is gorgeous!! Now that I’m in my mid-30’s, and I really enjoying home decor. I love decorating for all of the seasons and making my home festive and fun. Your ‘festive’ family room was well named! it looks like a really fun place to be. 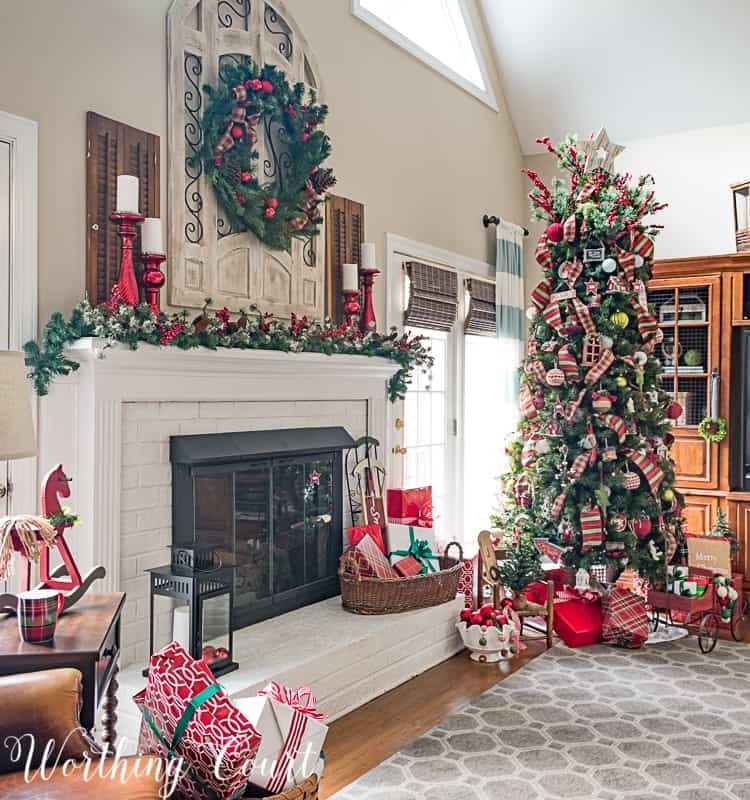 There’s so much ‘neutral’ around, that it’s great to see the red and old fashioned Christmas look! Looking forward to your decorating ideas in 2018. I need help with decorating, glad I found you! Your beautiful home is what I want! I would like to be able use all your ideas and make my home as great as yours. I will start with your entryway, perfect! Love your Style. My Aunt just put them same counter tops in her kitchen. Love the sparkle. I love all the ideas and decorating tips!!! I love your DIY projects! One of my favourite sites. Thanks.